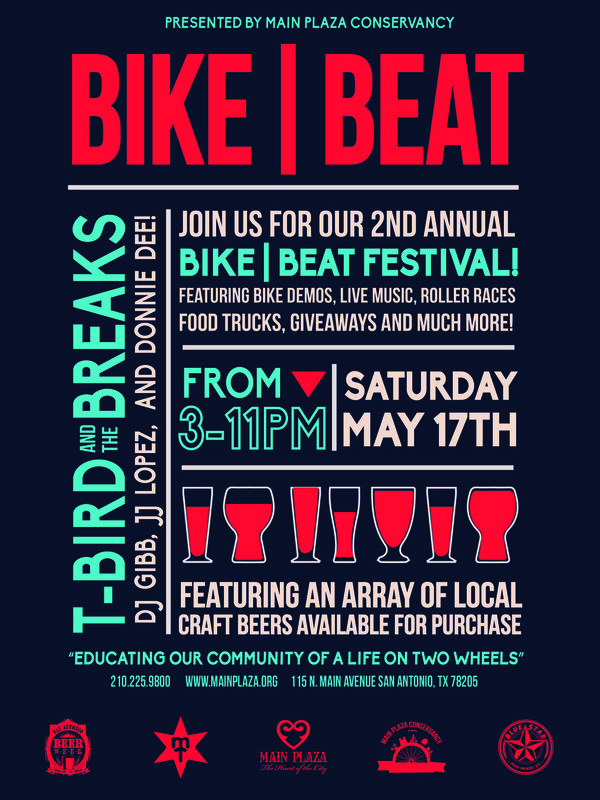 MAIN PLAZA CONSERVANCY is proud to announce the 2nd Annual BIKE|BEAT Festival taking place Saturday, May 17, 2014 3PM-11PM. BIKE|BEAT is produced and brought by Main Plaza Conservancy, a grass roots nonprofit and advocacy initiative devoted to bringing incredible entertainment and cultural awareness to our community. Main Plaza’s BIKE|BEAT vision is for bike riding to be a mainstream transport choice in San Antonio’s culture to promote a healthier, safer lifestyle, and social camaraderie. Our program will encompass the latest in cycling fashion, food, drinks, local music, bike performances and demonstrations, shopping, organized rides, art, safety classes, roller races, bike handling and maintenance, and educating our community of a life on two wheels. Main Plaza Conservancy’s goal is to normalize bike riding within the everyday mainstream cultural life in downtown San Antonio for a healthier and greener lifestyle. BIKE|BEAT is FREE and All-Ages! Join us for the ride! Main Plaza Conservancy’s BIKE|BEAT (MPCBB) is this year's premier biking event for Downtown San Antonio, specifically in “The Heart of the City.” Featuring an impressive array of cycling inspired exhibits and resources, the festival will impassion our local community, bringing riders and vendors together for one memorable Saturday. What: Bike Beat is San Antonio’s premier biking event of the year with the emphasis on educating our community of a life on two wheels; enforcing proper etiquette, safety, maintenance, and bike handling.